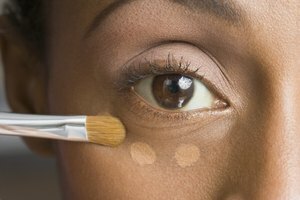 What Cosmetics Help Hide Eye Bags? There are several cosmetics that aid in diminishing the appearance of under-eye circles. 1 What Cosmetics Help Hide Eye Bags? There are several causes of dark under-eye circles and bags but the result is the same: looking tired and worn. Using the correct cosmetics can banish bags, eradicate circles and keep you looking bright eyed and wide awake no matter how you slept the night before. Use an illuminating concealer pen, which is easy to apply and offers ample coverage. Make light strokes with the pen brush in the dark areas just underneath the bags. Avoid applying concealer directly on the bags. Pat lightly with your fingertip to blend. Highlighting this area helps banish hollows, making puffiness less prominent. Try applying the pen at the innermost corners of the eyes to lessen shadows in this area for a more wide-awake look. Camouflage brown shadows under the eyes with a peach-colored concealer. Brown or yellowish shadows may be caused by excess pigmentation due to heredity, sun damage or both. If you press on the area and it doesn't appear any lighter, you likely have excess pigmentation. Using a concentrated, creamy concealer with slight peach tones works best to tone down brown or yellow shadows. Apply the concealer by tapping it lightly with your finger onto the dark areas underneath the eye. Use a yellow-based concealer on under-eye discoloration caused by blood vessels. Dark under-eye marks that lighten when pressed may by caused by visible blood vessels showing through thin skin. Dark circles from blood vessels typically have blue or purple hues and are best covered with a yellow-based concealer. Choose a creamy concealer that is slightly lighter than your natural skin tone to help brighten the area. Tap the concealer lightly over the dark areas only. Make it a habit to apply eye cream twice daily, especially at night. Products that contain vitamin C and caffeine can help with both puffiness and dark circles. Using a retinoid cream underneath your eyes can build collagen and plump skin. Look for eye creams with ingredients like hydroquinone, licorice and kojic acid that can aid in lightening superficial pigmentation. Avoid irritating sensitive eye tissue with scented products or those containing salicylic or glycolic acid. For darkness caused by pigment or sun damage, make sure to apply sunscreen up to the lower lash line daily.